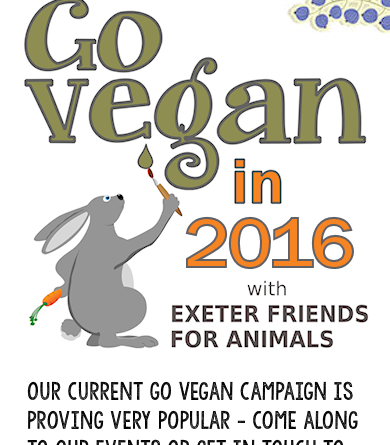 Our “Go Vegan” campaign just goes from strength to strength! This year we introduced a couple of new events – the Great Vegan Breakfast at The Cavern and a special Vegan Carvery at the Farmers Union pub – and we were overwhelmed by the popularity of both. Our thanks go to the respective chefs, Ben and Mike, for catering to the huge demand. Indeed, the carvery (with 101 bookings!) was so successful that chef Mike is organising another on 5 June. Our screening of Speciesism at Exeter Phoenix’s luxurious new Studio 74 was also well attended and prompted some interesting discussions in the bar afterwards. 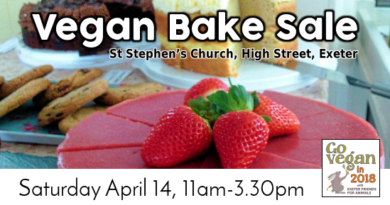 And finally, our ever-popular Vegan Fair & Bake Sale was a resounding demonstration that going vegan doesn’t mean going without – quite the contrary! If you missed this year’s events, don’t forget that EFFA is happy to provide help and support all year round to anyone seeking to try a vegan diet – just drop us a line or check our calendar of events to see where we’ll be popping up next!